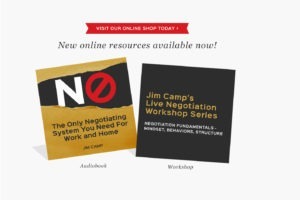 Camp Negotiation Academy offers online books and recorded workshops. If you want to improve your negotiation capabilities but are not ready to work with a Camp Systems coach, consider using the tools previously only available to our coaching clients. The Camp Negotiation System takes you and your company out of the compromising mindset and into a position of control, so you’ll never lose another negotiation… period. Learn the decision-based system that shows you how to be an effective and respected negotiator that gets more of what you want.